Well, what a week we had over on the Isle of Skye. A holiday I will never forget and a place I think I’ve forever left a little piece of my heart in. It’s really easy to forget what we have, almost on our doorstep, on this little island of ours. Yes, you can travel for 15 hours on an aeroplane and be on the other side of the world, but you can also travel 15 hours in your car and arrive somewhere that feels out of this world. And for me, that’s how Skye felt. Out of this world. Myself and Mr Knutts went on Honeymoon to Iceland and my heart has yearned to go back there ever since. The scenery, the landscape, the people, the uniqueness of the place, all make me want to return but, do you know what? Some of that yearning to return to the land of Ice and Fire was tempered by this holiday to Skye. This little Misty Isle, just off of Scotland’s west coast is in many ways, very similar to Iceland. Yes, you don’t have the active volcanoes, you don’t have the Geysers and geothermal pools, but glancing upon the landscape on Skye was like looking at an older Iceland. A step back in time. A place which, in many parts, is totally unspoiled by man. Frozen in time. A mountain in Glencoe. You’ll drive through here to get to Skye if you choose to go it alone in your car. We set off at 2am in the morning so the kids could hopefully sleep for half of the journey. I was fully preparing myself for a nightmare journey but do you know what, it really was ok! No screaming. No fighting. No bribery, sorry, incentive required, just eager anticipation and excitement about our looming week of adventure. We always stop off at Tebay Services and this was our first port of call. If you’re ever heading up towards Scotland or driving back home on the M6, make sure you stop here! It is literally THE BEST service station EVER. 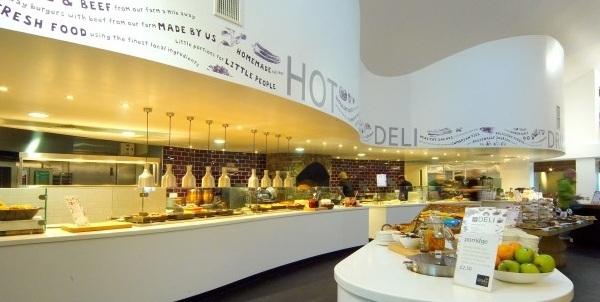 Yep, seriously folks, I am excited about a motorway service station. How times have changed! There are FANTASTIC family facilities here. Family toilets with baby changing facilities, which are very clean, a soft play area for the kids to burn off some energy, fresh and locally sourced food, a kitchen area for families so you can heat baby food/pouches/milk and there is also a wonderful farm shop which you can pop in to pick up some essentials (or treats!) should you need to. We had a cooked breakfast, the kids played and stretched their legs, we finished our pots of tea and coffee and then it was time to get back on the road for our next half of the journey. The drive gets far more scenic once you’re past Glasgow. You hit Loch Lomond, Glencoe with it’s awe inspiring scenery and then onto Fort William which is always our next stop because it has a Morrsions (yep, again, my life rocks!) and (dare I say it…) a golden arches. Seriously, after a good few hours in the car with no moaning, I couldn’t begrudge my kids a McDonalds as a treat. From Fort William onwards, you kind of leave civilisation behind for a while and pass through smaller villages and towns. There are still plenty of places to stop from here-on if you need to. I spied LOTS of pubs. 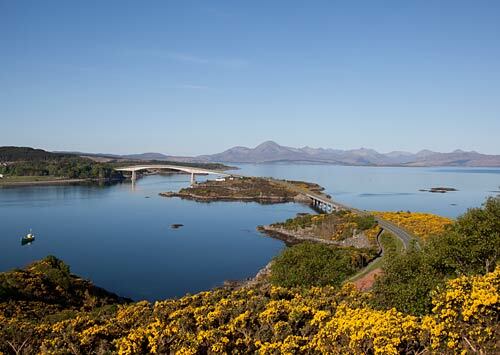 Once we reached a place in the North West of Scotland, called Kyle of Lochalsh, it’s over the bridge which takes you (literally) over the sea to Skye. There is no longer a toll for this bridge (after a few years of campaigning by locals) so you can just drive on over. In the spring/summer months, you can get a ferry from Mallaig over to Skye if you wish to break the journey up. It doesn’t make the journey any shorter, but it does mean less driving if you need a break. Once onto the island, we drove North into Portree which is Skye’s ‘capital’ I suppose you could call it. This is where you will find the most hustle and bustle (but by my standards, it was still very quiet!) and all the amenities you could need. A Chemists,a hospital, gift shops, pubs, fish and chips, etc. The biggest supermarket on the island is the large Co-op in Portree. It’s a really decent size, has everything you could need (yep, including Gin, oh and a whopping 1.5 litre bottle of Vodka!!! No, before you ask, I didn’t buy it!) 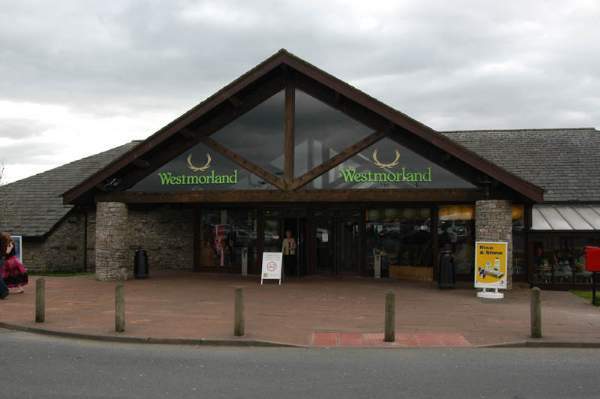 and we did our big food shop here which that lasted us for the week. There are 2 other smaller co-op’s on the island too, another in Portree and one in Broadford in the South. Tesco apparently do a drop off service on the island, and we saw an Asda van on there too. They rarely deliver to your home over there but you can meet the driver in a lay-by and he will plonk the food shop in your boot and off you go! Simples. You can also do your bit and shop local. There are loads of independent bakeries, fishmongers, butchers, shops and farms that sell produce on Skye so be brave, get your explorer hat on and have a look. You never know what you might stumble upon. We stayed at a lovely house called An Aisling (a mum from school has a daughter called Aisling so that was an easy one to remember!) – it is apparently Gaelic for ‘dream’ or ‘vision’. Anyhow, I stumbled upon the place when I was trawling the internet one night. It was big enough to fit us and my parents in and gave us plenty of room should someone wish to escape to a quiet spot…I can only dream of this day. You can find a link to the holiday house, here. The house was situated in Fanks, near Edinbane in the North West of Skye. Despite it being out on a bit of a limb, we were only a 10 minute whizz down the road to Portree should we need anything which was reassuring with kids in tow. It was very well situated for exploring the entire island and we didn’t need to drive for more than an hour to see most of the main sights on Skye. We would thoroughly recommend An Aisling as a base for any Isle of Skye holiday. I shan’t ramble on too much and bore you all to death about what we did, but I will give you a breakdown of where we went and what was good and what was bad. The first day we just went out to explore the beach at the end of our road which was in front of the holiday house. There is a fish farm in the loch you can see and the walk is a simple hop over a stile on the fence and then a little trot down to the beach. It was a lovely little spot with nobody else about apart from some sheep! The kids looked in the rock pools, climbed some craggy rocks, threw stones and boulders into the sea (like watching the Highland games in action without the talent) and splashed about in their wellington boots. We had a lovely morning. The route is not suitable for a pushchair or wheelchair. I don’t in any way condone littering but this did amuse me. Of all the bits of rubbish to find on the beach, we found this. It was like a sign… Now, on a more serious note: TAKE YOUR LITTER HOME!!! Myself and my mum then drew the short straw and had to drive to the Supermarket to buy provisions for the week. We cause a bit of chaos in the co-op because we bought so much and caused a traffic jam at the tills. Neither the checkout nor the trolley were big enough to fit all our stuff in and the poor checkout lady must have thought our shopping selections would never come to an end! Sorry everyone in the supermarket that night…we shan’t do it again! The coral beach at Claigan is a ‘must see’ when on Skye. The crystal clear water and the white ‘sand’ combine to make a scene reminiscent of a tropical beach, minus the warmth 😉 The sand is in fact crushed coraline algae which has been washed up on this section of beach. It is all the more stunning because of the black rocks which surround it. The contrasting colours are beautiful and a camera really can’t do it justice. The walk from the car park takes about 25 minutes and we took a picnic down to the beach with us and made a day of it. You can’t make sand castles or anything but you can splash in the clear water, find seashells (though they do ask that you don’t take them home) and explore the landscape around you. We scaled a large hill (to be honest, I wanted to write mountain but it wasn’t…it was a cliff) with the older ones and zoomed back down to join the others for a ham sandwich afterwards. On the way down to the beach there are a few stream crossings and there are the remains of an old croft house you can explore too. The route down to the beach is suitable for a backpack carrier with a toddler but not a pushchair or wheelchair. You can find walk details here. On the way back from Claigan, we stopped off at an old cemetery. There are ruins of a 17th century church there called St Mary’s and it is the resting place for many members of the MacLeod clan. It might seem a bit morbid to do such a thing but it’s a fascinating way of learning about the history of a place. You can find out an awful lot just by reading the headstones. It was a really peaceful place but also quite eerie. The ruins were stunning and I stood in there for quite a while wondering what life was like when it stood there in all it’s glory… The kids spent their time, completely unprompted, placing Daisies they had found on the headstones. Such a lovely thing to do. There is a walk around this area which you can find here. We didn’t do it because we had been out all day but it looked like a lovely one to do with stunning views. We didn’t walk it but we did drive through it twice while we were there and it is breathtaking. I’m not even exaggerating. You can find information on walks here. Again, it would not be pushchair friendly but a backpack carrier would do the job. There is a route you can take which is all mapped out to see different points of interest along this entire coast line. Because we had the kids, we just chose to do the main one which was the Dinosaur footprints on An Corran. They have been perfectly preserved in the rock and you can literally touch them. It’s magical and baffling to think you’re touching where one of those magnificent beasts once placed it’s foot. The kids thought it was superb and the footprints were very easy to find. The beach is lovely too. Unusual Grey sand which good for digging in if it isn’t too chilly! You can find information on the route here. I’m not a beer fan (sadly the Isle of Skye’s first Gin distillery still isn’t open yet but I will be partaking in some once it’s first batch is released! Keep your eyes peeled for Misty Isle Gin!) but Mr Knutts is and no trip to Skye would be complete without visiting the brewery. He and my dad stocked up and they were like kids in a sweet shop in there! They both informed me the beers were great and the amount of bottle recycling we ended up with at the holiday house is testament to this. You can find directions to the giddy gear of Skye here. This is another natural wonder Skye has on offer. Basalt columns rise up from the sea and are broken up with layers of dolerite. You can clearly see the distinct layers in the rock on the cliff face from the viewpoint and the waterfall there plunges straight into the sea. On a windy day it has been known to get blown back on itself and the water never reaches the bottom because it’s turned into spray! It’s magnificent! To give you an idea of what you’re stood on, here is a photo of it from the sea. Spectacular, eh?! Again, we only stopped for a short time because we had the kids and they were less impressed with the waterfall after just touching a dinosaur footprint, but we saw it, ticked it off and then headed on our way again. You can find info on it here. They have a cafe there if you wish to eat in and you can also get the pies to takeaway as we did. As well as the cafe, there is a craft shop where they sell all sorts of wonderful handmade items such as scarves, jewelry and wool. There was also a spot of yarn bombing on the gate as you go in…love it! The main attraction on Skye has to be Fairy Pools. Loads of mini waterfalls and some huge ones all falling into each other as they make their way down from the mountains. Set in the shadow of the Black Cullin mountain range, it’s easy to see how people thought mythical creatures lived here. The water in the pools is crystal clear and almost has a green/blue tint to it. It truly is something you have to see to believe. The walk from the car park isn’t easy, it’s quite a steep climb back up at the end but the path is well made at least. There are a couple of boulder river crossings and the water was running pretty fast when we went, however there were still lots of people about and a kind american from Utah who was on his honeymoon took pity on me and my short legs and helped me jumping across a couple of the boulders! The walk up to the pools was lovely but do keep an eye on the weather. You wouldn’t want to be stuck down in the valley with kids in bad weather. The kids loved being able to get across to the middle of one of the pools and sat there for a while contemplating life. I was contemplating the walk back up to the car and having to navigate the boulder crossing again with my mini legs. Oh the shame! You can find more information on the walk here. This beach is apparently the fossil hunting goldmine of Skye. With our budding paleontologists in tow, it was only right that we take them and give it a whirl. We looked up the walk and it looked fairly straight forwards apart from a section which mentioned a stream you need to cross but, if the power station isn’t diverting the water, can be impassable. It did also say this doesn’t happen often now because of the hydro-electric plant there so we assumed we would be fine and set off. “Are you going down there?” one of them said whilst panting and trying to catch his breath. “Well, good luck. It’s a long way down and just remember, you have to come back up”. “Come on then!” shouts Mr Knutts. Sodding wonderful – off we go then. Ignore my gut instinct and the 2 men we just spoke to and let’s walk off this cliff top. We get 1/3 of the way down and after a few swears by me and my dad, my parents and I decide enough is enough and Ben (the toddler) can’t go any further down. It’s too dodgy and getting back up it again will be nigh on impossible. I am not joking when I say the walk down was almost sheer. I was, perhaps, pooping my pantaloons a little bit. My parents take the car key with them and set off with the toddler back to the safety of the car. Very sensible. The older 2 boys and my husband however, are adamant they’re going down. And down we go. A very long way down. 140 m to be precise. We reach the bottom and find ourselves in a scene reminiscent of a Zombie apocalypse movie. Barbed wire. Fences. Keep out signs. A deserted building. All very ominous. The building is part of the hydro electric plant but it’s very eerie and it gives me the creeps. The sea lashes at the rocks, it’s not a peaceful beach, and I feel like crying and eating the packet of custard creams I took down there with me in case of emergency. This was almost an emergency, wasn’t it. Upon reaching the beach, after hopping over a stile with some more barbed wire either side of it for added peril, we made it onto the rocks near the stream that can, “sometimes be impassable”. Well, what do you know. Today, it is one of those sometimes days. The ‘stream’ is a frothing torrent of water and resembles a river rapids rather than the babbling brook I had visualised from the description. Absolutely amazeballs. We have come all the way down this chuffing cliff face for no reason because we can’t get to the beach the other side! No fossil hunting today. Not a chance. The kids take it pretty well and we spend a bit of time down there looking at rock pools, seal spotting and rock throwing. Despite the fact we couldn’t fossil hunt, they weren’t too downhearted. I however, was edging ever closer to that packet of emergency custard creams. We decided to make our way back up the cliff face and set off at a sensible pace. We then see another couple and their toddler heading down so I use this as an excuse to have a rest so they can pass us. Aren’t I considerate (unfit). They ask us if this is the way and we say yes but that they can’t pass the stream. They look downhearted but decide to head on down anyway. Good for them, no defeatist attitude there. We see them once they are down there attempt to cross the ‘stream’ but they too can’t manage it and give up so it wasn’t just us being cautious. Once we reach the top, I take some photos because I vowed at that moment to never return to that place as long as I live. Yep, that’s how bad it was. I literally crawled up the last part…I could see why matey had those knee pads on now! So, in short, I wouldn’t recommend this beach if you’re going as a family or with kids. Could you guess that response was coming?! If you’re still interested in trying this ‘walk’ for yourself, you can find it here. seeing the Northern lights. 3 times. Myself and Mr Knutts spent 10 nights in Iceland in the hopes of seeing them but to no avail and yet here on Skye, on our second night, there they were. The universe was kind to us (and so was the sun and the clouds!) They aren’t like you think they’ll be, lighting the sky up green and pink in front of your face, but more of a white luminous glow which gradually builds until it becomes bright. You are sometimes lucky and see the colours with your naked eye but more often than not, here in the UK anyway, we get the bright light and shapes unless it’s a very strong solar storm hitting us. As we watched, we then saw shapes in the light. Columns at first, like search lights in the sky, but these then changed into blocks of dense light which moved and changed like smoke does from a fire. Haunting, baffling and unforgettable. And do you know what, those 3 words pretty much sum up Skye for me too.